The BalShag Tube holds 23 golf balls. 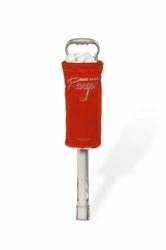 Features include: durable aluminum tube, stainless steel clips and plastic ring for a no slip grip. 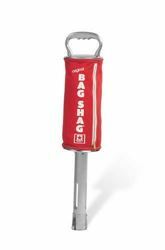 The BalShag is designed to retrieve individual golf balls. If you are looking for a product that retrieves and stores golf balls. 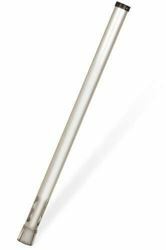 The GROOVE TUBE is a simple golf club cleaning system to help keep your clubs spotless and looking new. It is easy to use, just unscrew the brush from the bottle and add water. Reattach the brush and you are ready to go. Just squeeze the bottle and the water will be released through a hole in the brush. You can attach the GROOVE TUBE directly to your golf bag with the spring loaded clip. The GROOVE TUBE features a large brush area to get complete coverage when cleaning. 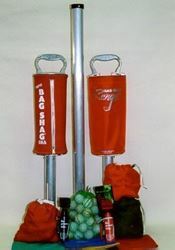 The Original Bag Shag Available in red, navy, black and forest green. Also available with an open top and no zipper for $ 35.00.